The site was comical. On my way to St. John’s Lutheran Church recently, I drove past a neighbor who was poking leaves with a litter stick and sliding them into a big white bucket. The odd part was, there weren’t enough leaves to rake, maybe a hundred scattered over his yard. “Why bother?” I thought. On the other hand, what a senior citizen does on a windy morning is none of my business. We exchanged glances, me offering a smile, he raising his eyebrows and chomping on the last inch of a stogie. I knew instantly that the man was trying to advise me. But about what? Cigar smoking wouldn’t suit my temperamental lungs, and gnawing on a cheroot would result in wife Kathy hesitating to kiss me. No, the counsel had to do with leaves. A few days went by before I understood that my neighbor wanted to help me figure out Ireland. 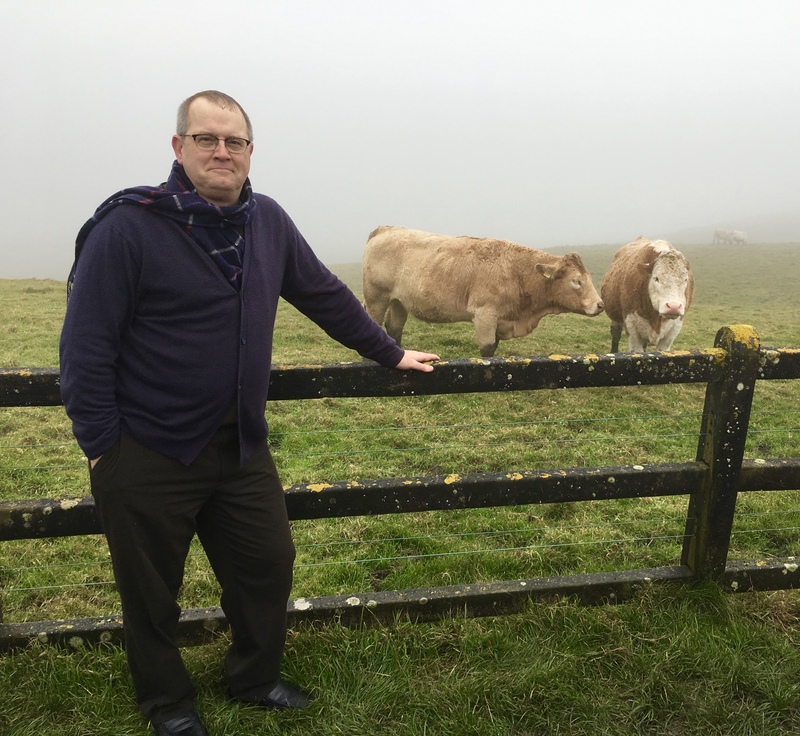 The author with two new friends at the Cliffs of Moher. No, I don’t normally wear a scarf with a cardigan. There was a chilly mist coming off the ocean. Then there was the countryside, where cattle and sheep grazed within stone walls, and church and castle ruins gave the land gray benedictions, as they have for centuries. 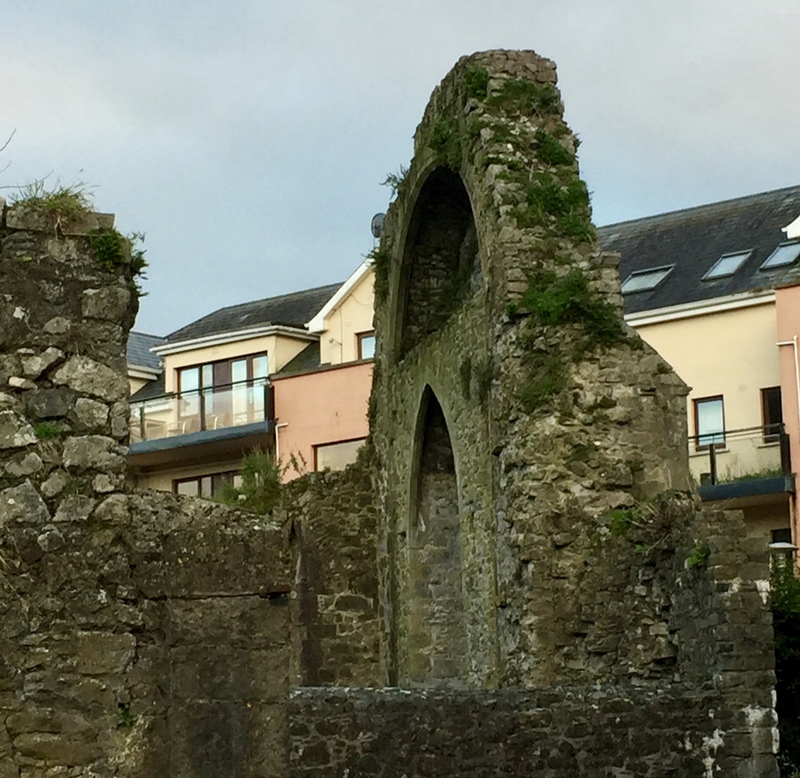 You can’t roam Ireland without feeling the inexorable passing of time. I’m home at the moment on an afternoon with intermittent drizzle—very Irish weather—but even now time’s gentle, but calloused, hands hold my face. Part of me is in Erie, but part remains at Kilmainham Gaol, where architects of the 1916 Easter Rising awaited the firing squad. Joseph Plunkett, who married Grace Gifford in the prison chapel hours before his execution, was not yet thirty. After the ceremony in his cell, the bride and groom were permitted to spend ten awkward minutes together in the presence of guards. According to the tour guide, they sat quietly. Another part of me reverences miles of stone walls. The only way to farm the island’s fields was to pry the limestone rocks out and pile them into long lines. During the Potato Famine (1845-1849), starving men were fed in exchange for clearing land and building walls that led nowhere. “Famine walls,” they were called. If grassy pastures were poetry, Ireland would be sonnets, beautiful but melancholy. My great-great grandfather, Timothy Coleman, most likely sailed from County Cork to America before the historic blight that turned the country’s main food source to smelly mush. A million to starved to death and about as many emigrated elsewhere. Ireland’s population has never recovered the loss. Stones, everywhere stones. Church ruins next door to apartments. Stone shape the landscape. 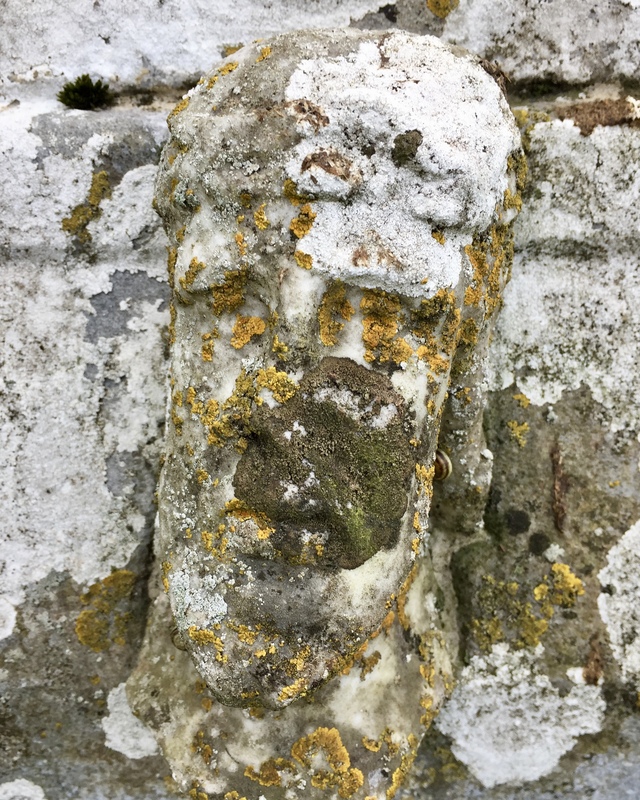 A dozen times each day, as I brushed ancient cathedrals with fingertips and tried to read eroded gravestones, Timothy’s absence haunted me. He was a farm laborer. I dreamt his face and imagined his voice. Part of me grieves for these ancestors I’ve never met and wonders with unfeigned love about their days and decades, their toils and joys. Ireland rests in my spirit like the fallen leaves I’m studying, just a scattering this fall in Erie, Pennsylvania. I can only gather them one at a time, like my Oniontown neighbor did. Timothy is but one leaf. Another is his wife Helen Salsman, who bore seven children. Someday Kathy and I will drive to Norwich, New York, and pay respects at her grave (1836-1918). We don’t know where Timothy is buried, which pains me a little. 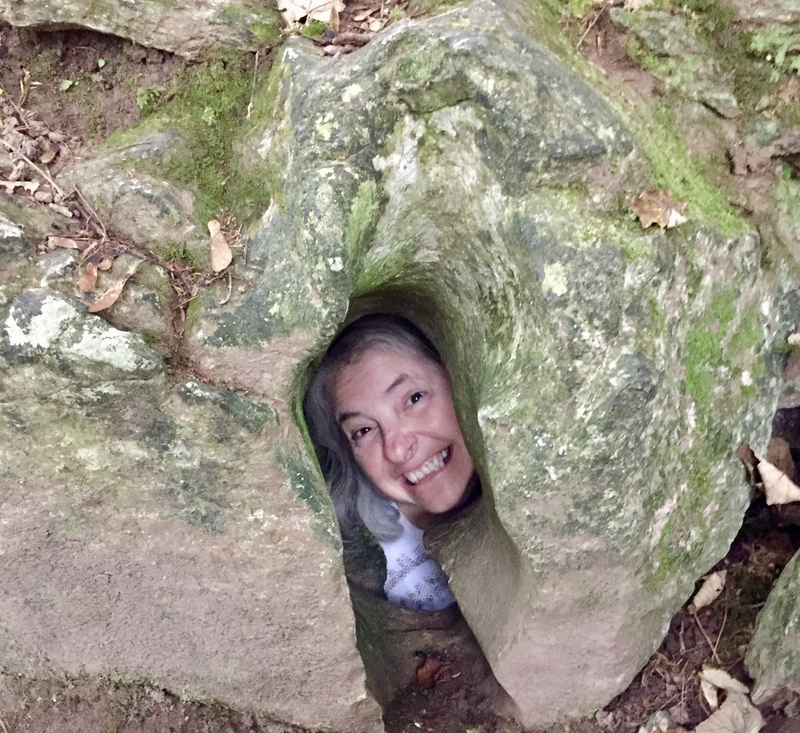 A gleeful Kathy peeking out of the Witch’s Kitchen on the grounds of the Blarney Castle. Leaf by stunning leaf I’ll sort through Ireland, maybe figure out why I was so moved by the walls and ruins, cows and sheep, friendly folks and all those starving spirits who built walls that now look like random adornment, innocent alleluias stretching toward the horizon. If you see me these days with my eyes closed, I’ll be imagining Timothy Coleman and remembering the island he left behind. And if you catch me chewing on a stogie, pray that Kathy will kiss me anyway. 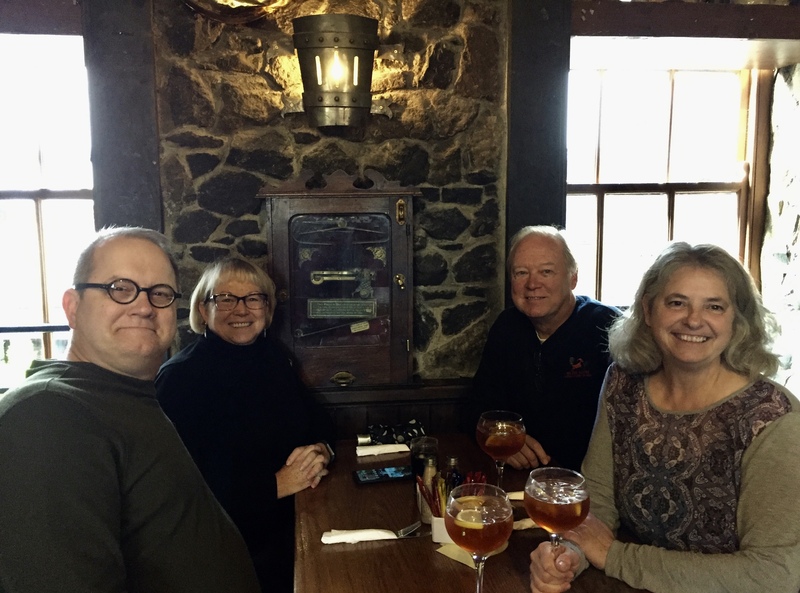 One of the best parts of Ireland was hanging out with Ed and Debby in interesting places, like this pub originally built in the thirteen century. 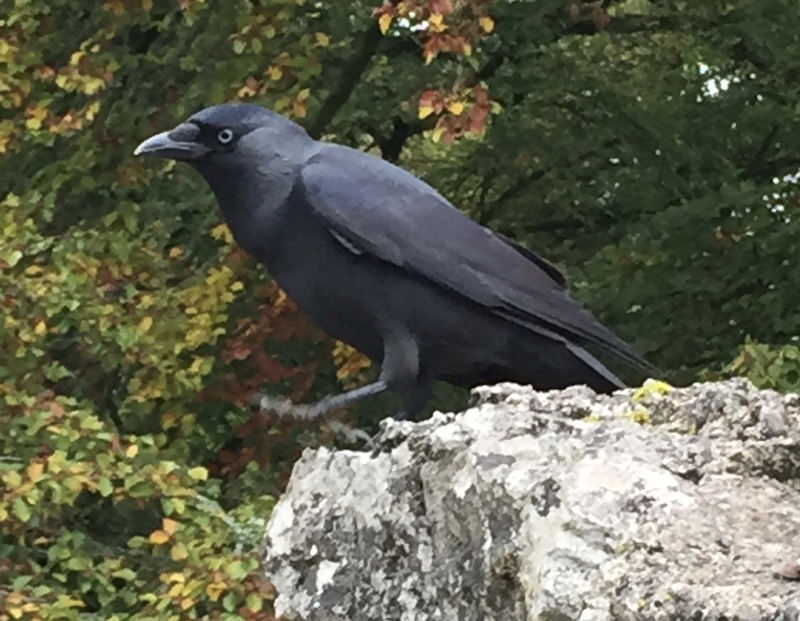 A crow perched on a stone wall in Blarney Castle’s Poison Garden. Stay tuned for a future post on the crows of Ireland. 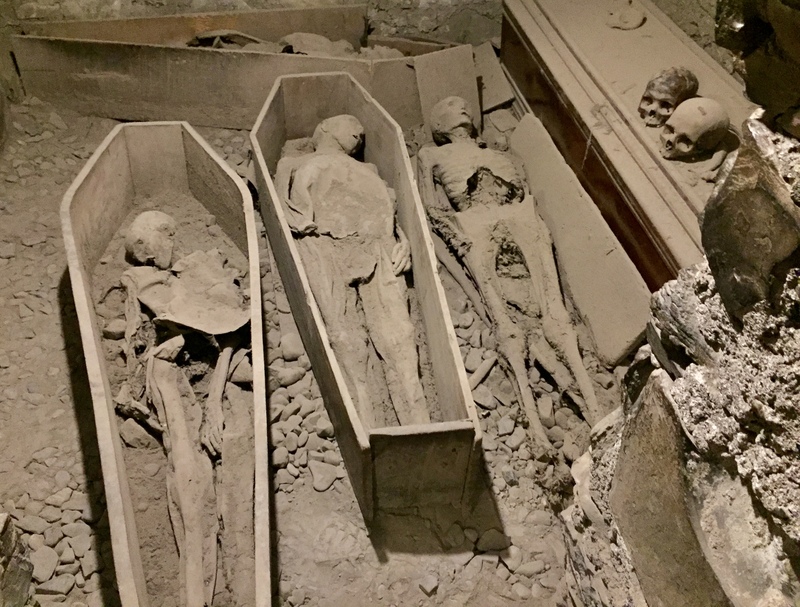 Mummies in a crypt at St. Michan’s Church. Again, stay tuned. So happy for you guys that you could go to Ireland! !